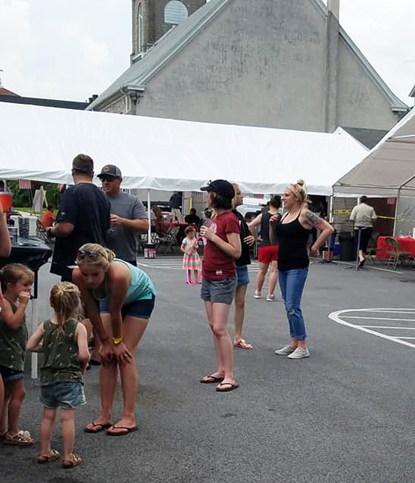 The main streets of Phoenixville borough are lined with pubs and restaurants that on most Saturdays are filled with patrons enjoying the food and craft beer. On the north side of town just a quick walk from the bustling borough’s commercial center sits St. Mary of the Assumption Church, at 178 years old the eldest Catholic parish in Phoenixville. Once a working-class steel town, Phoenixville is now home to a millennials and young families in addition to the longtime residents. Volunteers at St. Mary’s were looking for a way to incorporate the burgeoning craft beer market, young people and seniors for an event that would help raise funds for maintaining the church. The answer: beer and barbeque. Parishioners held the inaugural “Beer-B-Q” event Saturday, June 2 on the parish campus at 212 Dayton Street. St. Mary’s organizers and pastor, Father John Hutter, devised a competition format featuring local BBQ-ers vying for a $200 prize. For weeks volunteers recruited the four contestants — Jimmy’s BBQ, Island Fusion, Two Guys Smoking and ButteredRollzBBQ — and solicited donations from seven local breweries. The forecast had called for rain but numerous prayers to the Blessed Mother worked, and the day was a hot and sunny one for the revelers. Parishioners showed up as the gates opened at noon and guests continued in and out all day until 6 in the evening, right before the rain started. 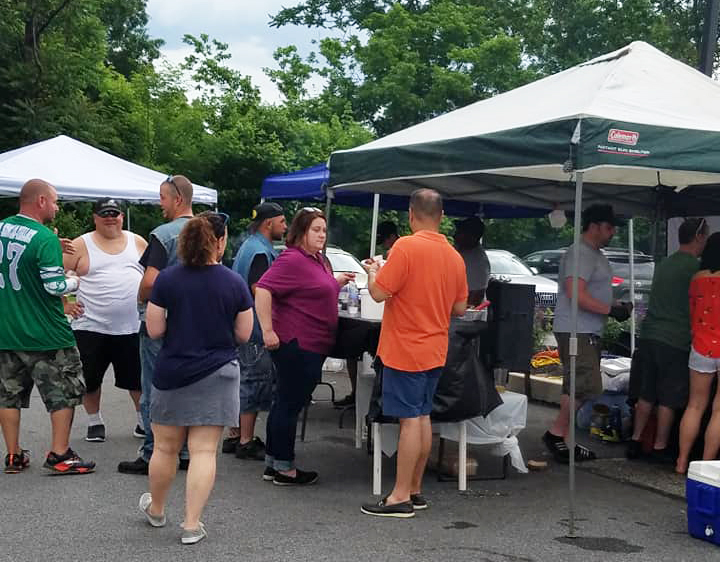 Residents of the north side Phoenixville neighborhood must have smelled the delicious food because many showed up to see what was happening. Phoenixville Mayor Peter Urscheler also showed up to speak with everyone and sample some food and beer. Children of all ages ran around the vast new parking lot, jumped in the moon bounce, played corn hole and enjoyed face painting. All children’s activities were free and hot dogs and hamburgers were available for the little ones as well. The beer tent was also run by volunteers with a tap set up by Jason Hinkle of Ideal Brew who donated his services for on-location draft beer bartending to the event. Brewers donating some of their selections included Sly Fox, Phoenixville; Tuned Up, Spring City; Rebel Hill, Phoenixville; Conshohocken Brewing, Conshohocken; Victory, Downingtown; Flying Dog, Frederick, Md. and Iron Hill, Wilmington, Del. Judges found the fare of ButteredRollzBBQ to be tops and the team generously donated the $200 prize back to St. Mary Parish. St. Mary of the Assumption’s organizers and volunteers, with the blessing of Father Hutter, plan for more fundraising events focusing on the burgeoning craft beer community in the area, while also remaining close to their roots and focusing on Christ and evangelization. The next St. Mary’s fundraiser is Oktoberfest, set for Sept. 29 featuring German beer, food and entertainment.